October is upon us, which can only mean one thing — besides the fact that it is socially acceptable to drink as many Pumpkin Spice Lattes as you want — it’s the beginning of Inktober! In fact we have rounded up some of the very best drawings from the first day of #Inktober and they are gorgeous. We know what you’re thinking, what is #Inktober? Well, it’s actually pretty simple. #Inktober is a challenge that lasts all of October, created by Jake Parker. Every October, artists all over the world take part in the #Inktober challenge, which is doing one new drawing each day, using pen ink, based on each day’s new prompt. "I created InkTober in 2009 as a challenge to improve my inking skills and develop positive drawing habits. It has since grown into a worldwide endeavor with thousands of artists taking on the challenge every year," creator, Jake Parker explains on the challenge's site. There are only four rules when it comes to the challenge. First, you have to draw in ink, but you can use pencil under the drawing if necessary. Second, you must post it online. Third, you need to use the hastage #inktober and #inktober2016 with your work of art. Lastly, you repeat steps one through three every day until October 31 (or as many times as you’d like within the month). Not too hard right? Yesterday marked the first day of October, and therefore the beginning of this year’s #Inktober and there are already so many amazing works of art being produced. The prompt for the day was “Fast,” and as a result there were some pretty epic ink drawings that we had to share with you. Keep scrolling for serious art envy! This artist is all about dessert girls and we are BIG fans. How did someone actually draw this one? It looks like a professional movie sketch. Hermione as an ink drawing is something we didn’t know we needed in our lives, but we do and it’s wonderful. We are obsessed with this artist’s use of color to bring more life to her plant witch sketch. Hello, this guy is so awesome. He looks like a cartoon character you’d see on TV. "Mob Psycho 100 Opening Lyrics." 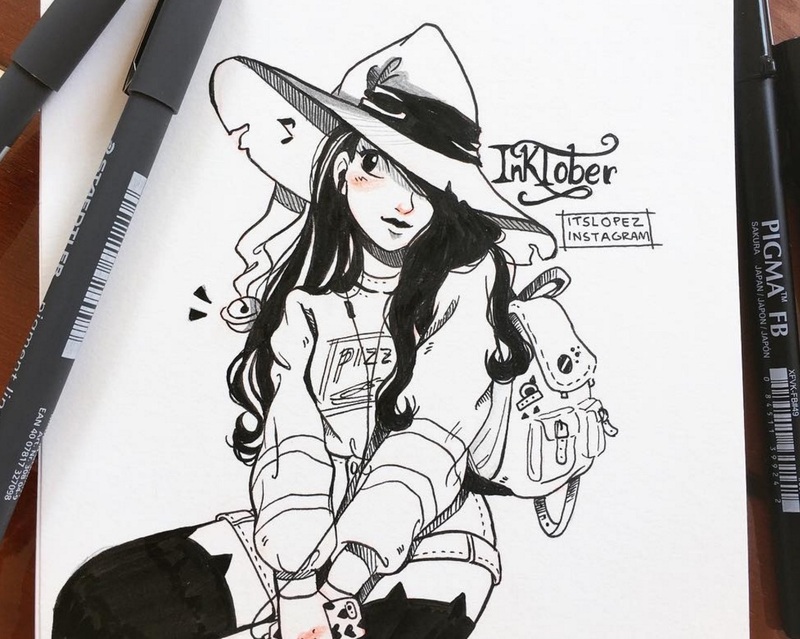 Another witch, another talented artist showing off their skills on day one of #Inktober. Yet another witch, and yet another chance for us to be in awe of these artists’ talents. Check out the rest of the prompts below, so you can join in on the fun this month… if you’d like!